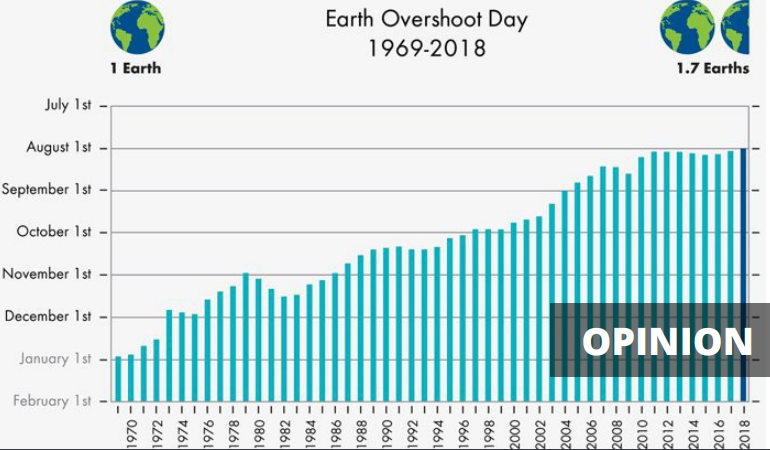 Earth Overshoot Day never fell as early as this year: on 1 August. From now until December we’re eating up resources that have accumulated over the past 4 billion years. An increasing number of these resources are steadily evolving towards “out of stock”. Earth Overshoot Day is calculated by dividing the world’s biocapacity (the amount of natural resources generated by Earth that year), by the world ecological footprint (humanity’s consumption of Earth’s natural resources for that year), and multiplying by 365. Moving back to sustainable levels of extracting resources doesn’t catapult us to the Stone Age. Back in 1987 the date was 19 December, leaving only 12 out of 365 days in overconsumption mode. But sustainability will require more than some woolly appeals to citizens to consume and live greener. Once extracted, a resource will be sold, used, dumped. Therefore, the key is to “keep the oil in the soil, the coal in the hole and the gas under the grass” – to borrow a slogan from the global movement for environmental justice. The problem of taking more from the earth than it can regenerate needs to be tackled at the source: where the digging happens. Keeping resources in the ground often boils down to a very unequal battle between a local community and a multinational machine with billions more in capital to bribe and bully its way through an often all too thin layer of environmental protections. The record number of environmental activists killed in 2017 should be seen in that perspective: the efforts to try to keep resources in the ground are rising, but so is the violence against the earth’s protectors. All these facts and figures matter, but so do stories. Stories have far greater power to move people than facts. Think of Boris Johnson touring the UK with his ‘£350 million for the National Health Service (NHS)’ bus. The news was fake but the story was great and history was made. So what’s the story based on facts that we already have, a story that can steer us away from the ongoing self-destruction? There are the stories of earth protectors that were killed while doing what they did to protect us all. Berta Caceres’s grassroots campaign successfully pressured the world’s largest dam builder to pull out of a dam in Honduras, but victory came after she was assassinated in her home by armed intruders, after being on a military hit-list. Heroes like Berta need to be remembered and world governments need to express more recognition for their invaluable work. But there are also the stories of success without assassinations. Indigenous peoples from India won a decade long fight against a London based multinational who wanted to mine their most precious resource: a holy mountain full of living resources. The divest movement pulled 5000 billion+ out of the fossil fuel sector. European activists occasionally succeed in stopping the production of a German coal mine, the largest source of CO2 emissions in Europe. In the Atlas of Environmental Justice, around 20% of the 2500+ flashpoints of environmental conflicts are success stories. If we want to #MoveTheDate of #EarthOvershootDay in a good direction, we sure need to tell the stories of struggle that are reshaping how humanity lives on this earth. Previous ArticleWho stole the beach?